Healthy skin for life is achieved through a partnership with an attentive, well-trained dermatologist. It is ensured through preventive measures, annual skin checks and honest dialogue with a doctor committed to leading-edge medicine for you and your family. This is the mission of the board-certified dermatologists and medical staff at Village Dermatology. Sun exposure happens in the most unlikely places, and skin cancer can appear in places that have never seen the sun. Prevention with sunscreen, sun avoidance and regular examinations by a dermatologist are your best ally. If you notice skin changes, such as a new spot or mole, don’t wait. Early detection is crucial. Come in and let us examine you. If you are over 35, an annual comprehensive skin exam is essential to maintaining your health. 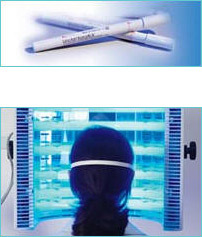 Village Dermatology boasts innovative technology for treating skin cancer and pre-cancers, including Blue Light Photodynamic Therapy. Face tomorrow with confidence. Medications and products are important, but so is professional advice. Our dermatologists understand all factors that influence acne, including skin type and age/gender-based hormone levels. We consider all variables, creating a custom treatment plan to clear up your skin. We offer services that compliment medical therapy for maximum effectiveness. Our aestheticians work with our doctors to provide treatments unique to your skin. This includes services like extractions, facials and peels. Early treatment is crucial to curtailing this persistent condition, which causes facial flushing, skin thickening, and may appear like severe acne across the cheeks and nose. Rosacea becomes more difficult to treat over time, so inhibit the onset with a confirmed diagnosis and effective treatment. Unfortunately, there is no cure. Rest assured, we offer effective, leading-edge treatments to manage your rosacea, from medicines to laser therapy. Your treatment will depend on which subtype you have. Unsightly though they may be, warts are rarely a serious health problem. They’re common among children, often popping up on fingers, toes and knees. Persistence is key in treatment, as warts can be quite stubborn. Freezing, chemical and surgical removals are all effective options available at Village Dermatology. If you’re concerned your child won’t tolerate the discomfort associated with traditional methods, we also offer pain-free treatments. Eliminating this condition can be a bumpy road for you or your children, but we can significantly speed up the process. Molluscum is a common viral infection seen mostly in youth, especially those with eczema. It is not harmful, but can become itchy, inflamed or infected. Molluscum is contagious, particularly when children bathe, swim, share towels or engage in skin contact and scratching. It will disappear, but may take months or even years. Common treatments include oral and topical medications, and sometimes freezing or scraping. We try to make the treatment comfortable for kids, so we most often apply a painless in-office topical medication. Patience is important, as multiple visits may be required to eradicate the molluscum. We generally separate visits by 2 to 3 weeks. There are few things in life as uncomfortable as eczema and psoriasis. Dry, itching skin is unnerving and distressing. Know that we stay abreast of current research and treatments for adult and pediatric eczema/psoriasis, offering more options for managing these irritating conditions. Lifestyle changes to consider? Use fragrance-free detergents, and avoid fabric softeners and dryer sheets. Forgo hot showers and baths, which dehydrate skin. Use gentle cleansers and unfragranced emollients after bathing, such as CeraVe, Aveeno and Cetaphil. No one likes being in the hot seat. Excessive sweating can be embarrassing and interfere with your job and other activities. We understand the issue and can prescribe medications to control your sweating. If these prove ineffective, Botox® is a great choice. It typically lasts about 6 months and is often covered by insurance. If not covered, we offer CareCredit, an interest-free payment plan to make this an affordable treatment. If you live on earth, you are at risk. We all accumulate damaging effects of the sun’s ultraviolet rays – even in small amounts – which present themselves over time in the form of brown spots, uneven tone, redness, broken capillaries, rough texture, wrinkles and lax skin. A lot of the damage is done in our youth, but it also happens when walking outdoors, riding in your car, sitting near a window or participating outdoor activities. I am not at risk because I am not a sun worshipper. There is nothing to do about it except major cosmetic surgery. I wear SPF 15 in my makeup every day, so I am adequately protected. If you have sun damage, you need to be examined by a board-certified dermatologist to ensure that you are free of pre-cancerous lesions and skin cancers. We often find worrisome lesions on patients during cosmetic consultations. It is never too late to start protecting your skin. Effective sunscreens and skin care products make a big difference in preventing further damage and reversing its signs. There are many options for treating sun-damaged skin. From products to peels to lasers to injectables, like Botox and facial fillers, there are options for everyone. We offer one-on-one consultations to develop a plan that fits your budget and lifestyle. IPL, Active FX laser resurfacing, and Blue Light Photodynamic Therapy are great options. Sunscreens are not created equally. Most people are not properly educated on sunscreen. Click here for Sunscreen 101. Removal of precancerous cells is absolutely necessary. We offer patients a better alternative to the painful blisters caused by traditional freezing. Levulan PDT is a revolutionary in-office treatment for precancers of the face, scalp, chest, arms and legs. Most patients with precancers make excellent candidates. Our dermatologists can assess eligibility based on your current condition and medical history. Recovery begins right after treatment with little downtime, and there have been no reports of scarring to date. Treatment targets and destroys only damaged or precancerous cells and some early cancers. Levulan PDT covers the entire area so that non-visible lesions are also treated. The majority of patients felt they had good-to-excellent results, and many patients experience high clearance for up to 1 year. Based on two medical studies, the majority of patients treated with Levulan PDT rated the cosmetic response as good-to-excellent. Typically, 2 treatments are required, 1 month apart. Treatment is reimbursed by Medicare, BCBS of Alabama, and many other insurance companies. Step 1: Levulan Kerastick® Topical Solution is applied to affected areas. It is left on from 1 to 3 hours (depending on location) in order for damaged cells to absorb the solution, making them extremely light sensitive. Step 2: The skin is exposed to a BLU-U® Light Treatment for just over 16 minutes, causing reactions that destroy the precancerous cells. Step 3: Immediately following treatment, you are layered in protective sunscreen. You must avoid ALL sunlight for 48 hours, so plan on relaxing at home after leaving our office for 2 full days.